Jiřinka is the main building of the compound consisting of fully equipped apartments, restaurants, wine cellar, wellness spa and playroom. The newest and the most sumptuous accommodation in fully equipped apartments. Each apartment has its own covered terrace and fireplace. The chalets offer maximum privacy in combination with all the services of the pension. This wooden house is hidden in privacy among the trees above the main building and guests can use all the services of the pension. We offer a wide variety of chalets and apartments, and amenities and services to accommodate those looking for an inexpensive getaway and those looking for an exquisite full service stay. Don’t settle for ordinary, come experience something special! 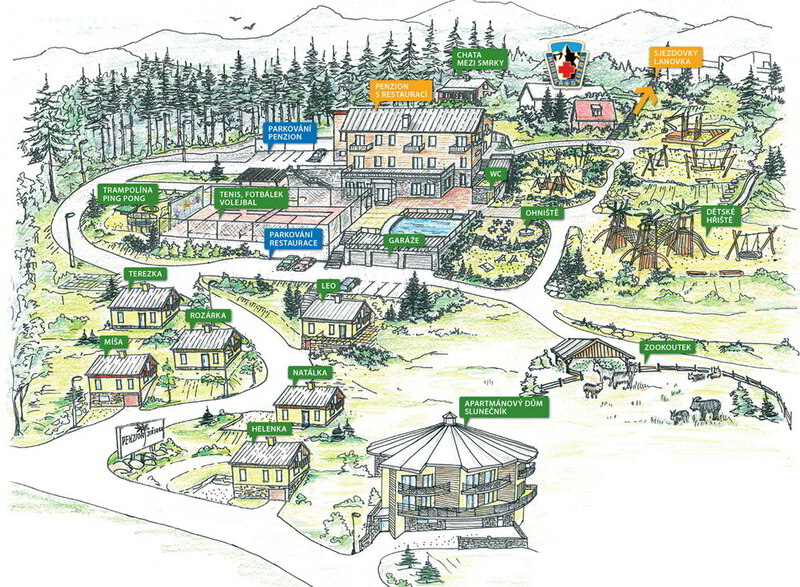 Jiřinka consists of 11 apartments in the main building, 4 chalets Depandance, one wooden chalet and since summer 2016 also apartment house for a family recreation - Slunečník, which consists of 8 apartments.